Just watched the button video. Car has a lot of grip! Would you mind sharing your gauges for race render? Congrats on the new PR, subtracting 5 seconds is an amazing feat at your skill level, awesome! Also, congrats on the DCS-off. I am fairly new to that as well and understand the trepidation. What I found out early on in turning it off was that I wasn't driving the car as smooth as I should be, gentle back on throttle is my new mantra. I used to stab at it and wow will the car rotate quickly when you do that with DSC-off. Smooth application as well, not necessarily slow, but smooth! Good lesson to learn and makes you a better driver (in my opinion). Also, the US MDM was just going nuts on me last time to the point the car was almost un-drive-able. Personal choice and I don't pressure folks into it but I do see the benefits now that I've tried it. You also learn how to counter-steer more often such that it becomes habitual. A good thing. Going to go do some research on these magical R1S tires now. Holy F! nice work! 5 seconds is incredible. Have you been sandbagging for the past 3 years? Lol. You may have just convinced me to drop $3k on aero. Where did you have the splitter done at? You go directly to the APR shop for that install and part? Last edited by dapopa9; 11-17-2015 at 08:45 PM. Haha!! Thanks!! No sandbagging---lighter weight, aero and grippier tires is the reason. Plus DSC-off was the icing. Racewerkz Engineering put all the aero on. They have a good relationship with APR. For that video lap you posted above which MPH data is that we are seeing? (Phone External GPS, AIM, or OBDII from Car)? AIM Solo DL is the data on the video. The AIM is really great when you want to collect lots of data coming from the CAN bus. It gets Oil temps, water temps, ambient air temps, all kinds of stuff. And the AIM people are super responsive about helping you with their software. They created custom calculations for me to show ft/sec acceleration. Really nice people. I also run Harry's Lap timer (HLT) with an external GPS receiver as a backup. They're usually very close to each other. The guy who makes it is also very nice. I've created several track profiles for HLT that are available in the track downloads Add Ons section. But HLT just can't collect the sheer data that the AIM does. Last edited by dogbone; 11-17-2015 at 11:54 PM. 1. Lower grip tires lose traction at lower speeds, so you can practice the skill of catching the car at lower speeds and less dangerous moments. 2. Lower grip tires will usually last longer while you're sliding around learning the skill. 3. Lower grip tires squeal more than high grip tires, so while your'e still learning, you can hear the warning signs that they're losing grip. Many high grip tires stay silent all the way until they lose grip. 4. Lower grip tires expose mistakes more than high grip tires since they lose grip more easily. That's what you want when you're learning. 5. While you're sliding around learning to drift and catch, lower grip tires are easier on other parts of the car since they lose grip more easily. 1. Michelin Pilot Super Sport - Great on street. Not a great track tire. 2. Hankook R-S3 / Yokohama AD-08 - Great tires to learn on. Both tires seem comparable in grip. AD-08's might last a bit longer than the R-S3. Both can handle track duty and still drive home. 3. Nitto NT-01 - entry level R-comp. Slide around pretty nicely. ONly a little faster than AD-08 or R-S3. 4. Hoosier R6 - slide around very elegantly. Braking is not as good as TD. 5. Hankook TD (soft compound) - Great braking, good in corners. Does NOT like to slide. Fights back very aggressively for grip which is not good if you like sliding and catching. 6. BFGoodrich R1S - High grip in all places. Fairly quiet tire. Does not give lots of noise feedback. Slide pretty well. This tire runs WIIIIIIDE for the listed size. When mounted and inflated on identical rims, the 285 R1S runs about 1/4" wider than a 295 TD and it has a blocky square shoulder. It's rubbing my fender liners in places that the TD never did. I need to use spacers in the front. After the R1S, the next step up in grip would be Michelin slicks. My advice is to keep using lower grip tires while you are getting used to DSC-off. Truly excellent advice all around, thanks for sharing your insight. As tempted as I am to rapidly accelerate through these tire options I will slow my roll and learn more along the way. I have enough experience now where I am not just chasing lap times but want to focus on skill development and car control. The lap times will come later when it all comes together (as you've just proven!). Thanks again, good advice for us all. -If you plan on trying a new tire, don't buy a used one----even if it's claimed to only have one or two heat cycles. Those heat cycles could be 2 hours long and the tire's grip will be burned out. Ultimately, just by looking at it, you can never really know if the high grip portion of the tire's life is over yet or not. Some high grip tires are magical in their first few heat cycles, but then they fall off quite dramatically. So, if you're going to try a new type of tire, make sure you get some brand new ones. That is the only way you will get to feel what they really offer. -I was talking to a guy who sells new Michelin slicks recently. And he made an interesting comment. He said that some of his clients buy super high grip tires like the Michelin slicks as a sort of "safety" measure because they always leave some speed on the table. What he means is that the driver isn't driving at the limit of the tire, so as a result, they feel a safety benefit. The reason I bring this up is because if someone were to jump straight from a Michelin Pilot Super Sport up to a Michelin slick (or R1S), they would have NO idea where the car's new limits were. Everything is different---braking, accelerating, cornering…….it would be a waste of the tires. They would go a bit faster, but not nearly as fast as the tires were capable of. By the time they started figuring out the limit of the tires and how to use all that grip, the tires would be past their prime. Building up confidence in the car's limits with progressively stickier tires is a safe way to keep exploring the next level. Going into this past Monday, I was wondering if I was trying too many new things at once since I had never driven full aero at Buttonwillow and the R1S tires were a complete unknown to me. Generally, I prefer trying each new thing one at a time, but I just couldn't stand looking at the tires anymore. I had to run them! But I had the same questions for myself: could I explore the limits of the aero AND the new tires before the tires' grip started dropping off? You're on a limited time clock because the high grip isn't going to last forever. And aero is a complex thing----the faster you go, the more grip you have….that's a weird mental hurdle to overcome---you need to go faster to have more grip…..ok, how do you sort that all out? Where are the limits? Anyway, I decided to give it a try because I already had two events at other tracks under my belt with the aero, and it was feeling really good. So, I figured since I knew Buttonwillow really well, I believed I could absorb it all. And then I threw one more curve ball at myself that day-----I turned traction control off because it finally was just too intrusive. Traction control just has no concept of aero or super sticky tires being on the car. The traction control in an M3 was never made to deal with that. Ultimately, I needed to turn it off because I couldn't explore the grip limit of the R1S's. But as I've said before, I didn't just randomly and blindly turn it off and hope for the best. I've spent several days on skid pads sliding around and have been driving about 25% of the time with DSC off. 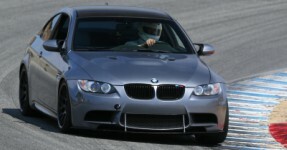 Anyway, I think it worked out, but I am looking forward to Friday when I can take another turn at Buttonwillow. Now that I've had a day with the tires, I know what they feel like and can hopefully push them a bit further before they get past their prime. (They have 7 heat cycles already, so grip is going to start falling off soon.) I'm hoping that with this new understanding and less wind, there's a bit more time to be gained. I was surprised to learn that wind could affect things as much as it did. I also learned that with the grippier tires and full aero, the transmission is working harder and overheats more quickly---if I ran too many hot laps in a row, a gear symbol with an exclamation point showed up on the dash, and then the car would refuse to downshift….so now, I gotta learn to manage the DCT temps….I've learned that in motorsport, when you change one thing, something else is always affected…. Now if I only had a full tech team chasing these things down for me…. How'd it go on Friday? Saw you were crushing the times again! Any better? It was nice and cold in the morning but not too cold that my tires didn't grip. Fun day Friday. Ran a 1:50. After looking at the data, I had a couple 1:49 laps going but ran into traffic at the end in the Esses.....it was a little tough getting clean laps at times. That's ok. The crowd is usually quite nice at Speed District events. I had fun hanging out with everyone. The cool 45 degree morning proved to be actually too cool for super high traction first thing in the AM. The grip showed up later. I am VERY VERY impressed with the BFGoodrich R1S tires. I ran the 1:50 on their 14th heat cycle. I was lazy about rotating them on Friday----I didn't do it. As a result, the front driver tire corded on the outer edge at 16 heat cycles. The other tires are totally fine. I'm sure if I had rotated them on Friday, I would have gotten 20 heat cycles no problem. Even at 16 heat cycles, they were still gripping fine. I will be running these tires again without a doubt. I'm even keeping the other three as scrub backups. Nice driving yesterday! Car looked nice and composed. There was quite a bit of traffic and couldn't get a clean lap in. One of the sessions, I hit the grid early to be first on the track. By the time I finished my warm up lap, they were still letting people onto the track and I got stuck. Ah well. Previous cars: '09 GT-R, '06 Z06, '06 Evo MR, '05 M3, '03 Evo, '00 Miata. Thanks! Your car is a beast! I was standing along the front straight wall and saw you on some afternoon hot laps. That GTR rages down the front straight. Looks and sounds good. Yeah there is an art to being an effective grid/hot pit boss, in terms of keeping a smooth flow on the track. Even gridding by lap time is tough. Everyone needs to get to the pit lane early and then they have to have everyone's times and then have a place to park everyone in order. And then they have to be willing to hold late comers until everyone on their warm up lap passes. Speed Ventures is the only group I've seen do it. You're right, it's a tough job. I've been absent from the track for most of the year and that's the first time I've seen that guy. Cool guy and felt that he did what he could. Traffic seemed to thin out around 2, but that was my last session of the day and had to head back home. Have me interested in those R1S tires, may have to try them sometime down the road. I've been buying race scrubs, but you never really do know what you're getting with them. Currently trying out some Yokos, had Michelins prior (really liked those). Josh mentioned that was the first time that start/finish boss worked with Speed District. I like Speed District a lot. One of the ways they've built their name is by having low car-count groups versus others that put 30 into a run group. But we ran into some fairly high car counts yesterday. My humble suggestion to Speed District would be, if they sell out to 65 drivers like they did on Friday, they should move to 4 run groups to keep the car count down in a group, and split the drivers by lap times in the more advanced groups. They give everyone transponders so it's not hard to track times. Personally I would rather have 6 sessions with lower car-count run groups than 8 with 25+ cars. Anyway, Josh is a nice guy and he wants everyone to have a great time. I appreciate his track days. Regarding R1S vs Micheln slicks---my understanding is that the Michelins are grippier than R1S. It goes NT01-->R6-->TD-->R1S-->Michelin slick. After that, you gotta shed weight and do aero. Come on down the rabbit hole! It's comfy down here!! I contacted Motorsport24 in Germany regarding their carbon doors. It turns out these are not just generic off the shelf items. You can influence the build of them. For instance, if maximum lightness is your goal, they can use less resin, etc. I was curious how much weight could be lost by replacing my stock gutted doors. I weighed my front doors and they are 35lbs each. I'll guess my rear gutted doors weigh about 30lbs each. The carbon front and rear M24 doors weigh on average about 5lbs each......!!! So you could lose around 110lbs from the car with a door swap. Nice!! Cost: 3950 Euro (includes VAT, but not shipping). Takes about 4 weeks. Anyway, I always wondered about the weight savings from doors. It was more savings than I thought it would be. And Motorsport24 was very responsive. If I were to do it, I think these guys would do a nice job. Jordan Yost's car runs them. I was chatting with him on Friday. He seems happy with his set on the coupe. 3950 euro for all 4? The prices are including 19% VAT excl. shipping. Delivery time is around four weeks." Thanks- that actually seems pretty reasonable for the whole set.